After we were in Malek in January 2017, Benjamin Anyoun reached out to me on Facebook and said that he was disappointed that he was not able to see us while we were in the country and hoped to meet me on a future trip. In further communication with Benjamin I learned that he has been working “under the SSAM radar”. His report should bless you as much as it blessed ours. In December 2003, I graduated from Nairobi Great Commission School with six other men. Paul and Marilyn Douglass flew from US to Kenya to witness the long awaited Great Commission graduation. We were fully equipped to take the gospel to our people both at home in South Sudan and in Uganda and Kakuma refugee camps where many South Sudanese were living in desperate situations at that time. By then there were Churches established by Yournew Wol and Victor Deng that needed more Evangelists to meet the huge demand of the work. 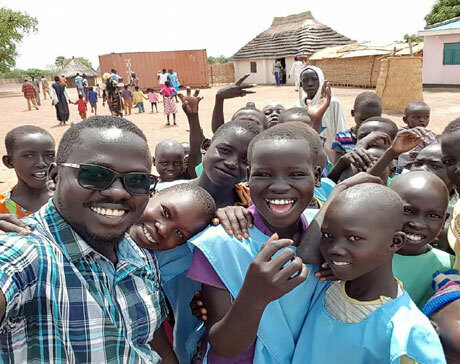 I didn’t go to either camp, because there were signs that the peace agreement was going to be signed soon and the refugees would go back to South Sudan. Eventually in 2005, peace finally came as predicted and almost all the refugees headed back home (South Sudan) to start a new life and rebuild their ruined country. That was twelve years ago. 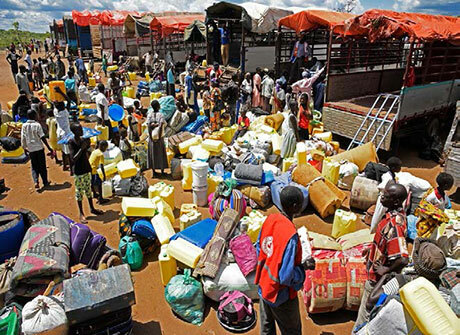 All hopes of a new peaceful nation, prosperity and tranquility was trashed and millions of South Sudanese were sent fleeing to neighboring countries for the second time as the result of the December 15, 2013 conflict and subsequent repeat of violence in July 2016 between the forces loyal to the President and former First Vice President. Once more, the hope of building a nation full of prosperity and stability was replaced with agony, suffering, fear, distress and frustration. South Sudanese are back to the refugee camps they deserted many years ago. Below are the statistics I collected in different camps in northern Uganda during my visit two weeks ago. 11,910 South Sudanese refugees arrived in Uganda between August 2-29 at an average daily rate of 425. The number of South Sudanese refugees in Uganda has now exceeded one million. New arrivals report that heavy rains, flooded rivers and worsening road conditions are making it difficult for South Sudanese refugees fleeing fighting in their country to reach safety in Uganda. Churches in Africa, they often meet under trees. Infrastructure in Amuru has been damaged by the flooding, including Unyama Bridge, which connects Adjumani district to Palabek Settlement. The damage continues to affect movement of people, goods and services to in and around Amuru district. 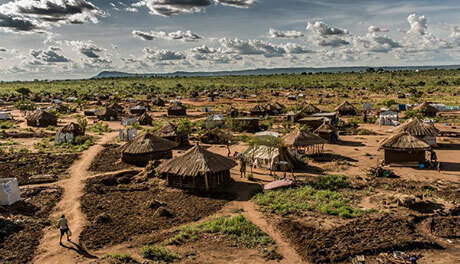 Omugo Settlement, an extension of Rhino Camp in Arua district, commenced receiving refugees on the 1st of August, and has so far received 6,130 refugees from South Sudan. In light with the above-mentioned situation, I could not hold back my tears when I saw the deplorable conditions they are living in. I went to Uganda to share with the refugees the message of Gospel and to establish a Church there as per the call of the refugees who felt neglected, abandoned and denied spiritual and physical needs. I was emotionally carried away as the memories of my early teenage years in a refugee camp trickled back in my mind and wondered how long these people shall endure this situation. With all these questions in mind, I remembered that I was commissioned many years ago to take the message of hope to the hopeless, restore the faith and win souls for Christ. It is in line with this CALL TO SERVE that I write this story. I have now decided to join the camps and bring Christ right to the doorstep of the refugees by sharing the love and peace that our Lord Jesus Christ gave us. I know that our Christian brothers and sisters in our churches are overwhelmed with the support they are giving the churches in Aweil, South Sudan, but it is our hope and prayers that SSAM will pay attention to the plight of our people. I and the team of Evangelists spent over two months evangelizing and holding crusades in different camps. 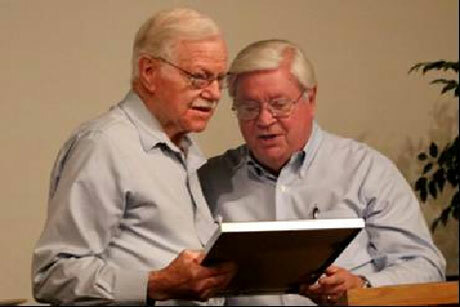 Sympathy is extended to the Douglass family at the passing of Bev’s brother/Paul’s son, Stan Douglass on August 15th. Sympathy is also extended to Deanna Holsinger’s family with the passing of her mother on August 31st. The work that Benjamin is doing with the refugees in Uganda. SSAM team working under difficult situations in Aweil and Juba areas of South Sudan. 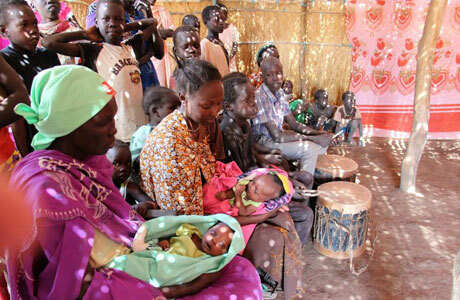 • Church planted in Amuru Refugee camp with 978 new converts. • Church in Kiryandongo Refugee camp with 1723 members. • Church in Bidibidi Refugee camp with 823 members. • Bibles and text books for church and school. • Construction materials to enable the church to put up temporary shelters. • Medicine for first aid to manage cholera and malaria outbreaks in the camps. • Financial support for me and few Evangelists. It my sincere hope that you will extend your prayers, sympathy and kindness through contributions so the word of God can be advanced in this part of the world. with more than 100,000 South Sudanese refugees. 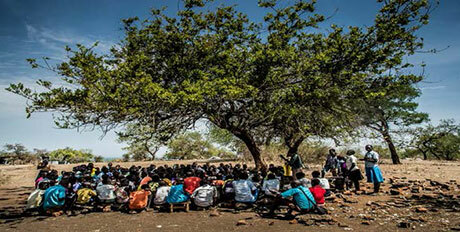 Communication with our partners in South Sudan has been a chronic problem. The days of posting letters that take weeks to arrive, or going to the nearest city to book a phone call and waiting for the operator to call back hours later are long gone. Even the days of waiting for a certain satellite to pass overhead or climbing a tree to get a signal are gone! Last Saturday morning, August 5th, we were able to receive a call from South Sudan (no charge to them or us) and we (Bev Campbell and Steve Holsinger) got to spend about an hour talking with Dr. John, Joseph, Angelo and Ezra. They sat around a cell phone on “speaker” in Malek and Bev and I did the same in Gresham. For the most part, the call was clear and understandable. The situation with civil unrest is more stable and fewer people are leaving the area. Malek Christian Hospital has been treating 300 people per day, primarily because of an outbreak of Malaria (It is the rainy seasons now). Dr. John is trying to secure a better, less expensive source of medicine, either from Nairobi or Juba. 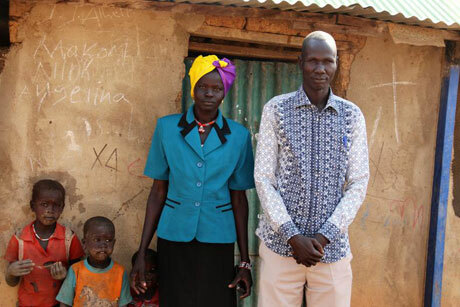 The Aweil Bible College has 30 students this term, including three women. Angelo, Daniel, and Ezra are teaching Bible Study Methods, English, How to Write a Report, Personal Development (Discipleship), The Book of Acts and Leadership. Many people have received food because of the “extra” (above our usual budget amount) funds SSAM sent. Thank you for your generous contributions and many lives have been saved. 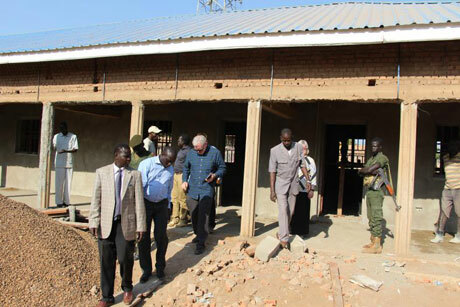 The office and church building in Aweil Town are being completed. Yournew is very busy leading the State as governor, but he has been helpful in transitioning the leadership of the mission to Dr. John and the indigenous board of directors, including Angelo, Joseph and Ezra. Peter Gatdet and Santino Makal are in Juba because of fighting in Malakal and Bentieu. They have teamed up to establish a new congregation, which is growing steadily. Their families are in Kenya, waiting for the conflict to die down. They all expressed gratitude for your love and prayers, and we were able to pray for them and with them. We plan to have a conference call once a month in addition to e-mail and social media contact. Praise God for continually improving technology! I have been reminded over the last few days of the amazing people God calls to become partners in our mission to South Sudan. 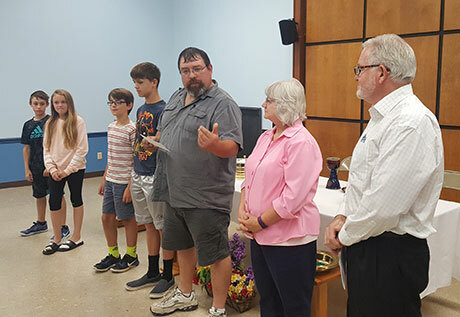 A couple with a daughter starting college and a new house under construction recently gave $3000 and pledged to give $7000 more over the next year. They want to help us EXPAND. EXPAND is a plan to raise an additional $100,000.00 to expand our influence in South Sudan by purchasing land in Juba and establishing a Bible school in Maiwut County. A lady in Molalla, OR, decided to help by doing a garage sale. She donated more than a thousand dollars! Another lady from Pennsylvania sent $645 with “EXPAND” in the memo line. The youth group from The Christian Church in Saint Helens, OR raised $5500,00 for a well in Apada. They did pie socials and a spaghetti feed. Their funds will be combined with a gift from the Poor Box ministry at Faith Christian Community in Anchorage, Alaska. Faith has an offering box at the front of their auditorium with a sign that says, “remember the poor.” Money from the box is used to meet pressing needs all over the world. God allows South Sudan African Mission to partner with some of the greatest people in the world, and we are very grateful to Him and to all of you! What is God prompting you to do to help EXPAND His kingdom? 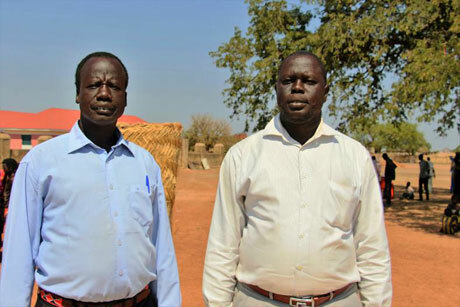 Dr. John, Ezra, Angelo and Joseph as they lead the mission in South Sudan. The 30 Aweil Bible College students and their teachers. Governor Yournew as he leads Aweil State. 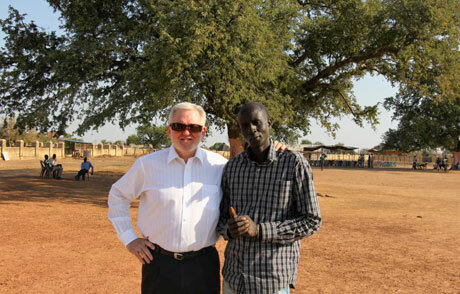 Santino and Peter and the work in Juba. I would like to inform you that I have started my exams this week and will be finished next week. I will be leaving for Juba and will be back in January to resume classes. I wish you well brother and sister in Christ’s services. Paulino with Deng, son of Paula and the late Cornelius. This year we have inaugurated a Sunday school in loving memory of Mother Marilyn Douglass and the school is called “Marilyn Douglass Primary School” Chelkou Church of Christ. Graduates of ABC will be employed to teach in the school and help plant churches in each community. Upon my academic completion, I will be starting two other self-supporting schools. One will be in Aweil Town, one in Juba and later one in Wau. Church planting will be coordinated with the establishment of the schools. May Almighty God bless you abundantly. I’m in Juba and I have communicated with our local evangelists. Our local congregation in Malakal is progressing well. Since I came from Nairobi, Peter and I have been engaged with our church members. Some were here in Juba and some came from Ayolo refugee camp. After we nurture this congregation and it is established fully I will visit Malakal and our congregation there. Elsewhere in this newsletter there is a picture of a steady stream of Sudanese people walking out of the country in search of safety and a reliable supply of food and water. The scene is the same at every border. The tribal civil war being waged by South Sudan’s political leaders is taking a terrible toll on the people. What is SSAM doing? We have consistently supported ministry in times of war and times of peace. Most aid organizations have been gone from the country for a year or two. The war is definitely affecting us; 80% of the money we send is being spent on food and medicine to help needy dying people. How will we respond to this latest crisis? We are planning to expand our efforts. We are trusting that either a peace treaty will be established that will stabilize the situation, or we will just increase our efforts in spite of ongoing conflict and instability. We plan to raise an additional $100,000.00 over the next 18 months to broaden our base of ministry. It will create a “three legged stool” as an expanded base for ministry. We are already completing our mission office and home base for the mobile medical clinic in Aweil town. Two of our leaders, Santino and Peter have been in Juba because of the fighting in their home regions of Malakal and Bentieu. They have established a congregation in the nation’s capitol. We intend to secure land in Juba to insure that we can have long‐term influence there. In addition to these developments, we have been invited to establish a Bible school in the Gambella region of Ethiopia, just across the border from Maiwut County, South Sudan. 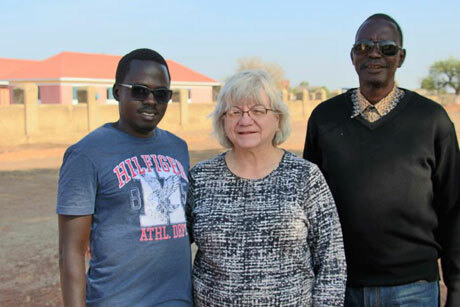 This Bible school will train leaders for four congregations that have already been established in the region, as well as preparing evangelists to share the gospel in the Southeast region of South Sudan. If you would like to be a part of this bold step of faith, designate funds to “Expand”. With no apparent advance notice, President Salva Kiir appointed Yournew Wol, the in‐country director of South Sudan African Mission, governor of Aweil State. Yournew said, “I cannot turn away from this responsibility again. I am trusting that Almighty God is behind this decision.” Yournew recommended that Dr. John Kuot be appointed director of the mission with Ezra and Joseph as key advisors. Please pray for all these men as we go through this transition of leadership. As a church, we read your May newsletter recently as part of our services. Every month we have a mission report that informs the body of what the current missions that we sponsor are doing. It is with much sadness that it took so long to read May’s news and find out something we should have done a long time ago. We all were very distressed to read about the church’s suffering because of famine and war. It is not something we can even begin to understand here in our nice cozy hamlets and 7 acre buffets, nor is it something we can ignore either. We read Acts 11 together where Agabus stood up among the brethren and predicted a famine would come to Judea. Verse 29 mentions “the disciples, each according to his abilities, determined to send relief to the brethren”. This really spoke to us as a group that we must do something according to our abilities as well. This is the purpose of this letter and the money that accompanies it (nearly $3,000). We have many brethren praying, but really we want to give to relieve the hunger endured by our brothers and sisters in Christ. May God bless your continued work in helping the Christians of South Sudan and may they find relief soon from this tribal war and famine. 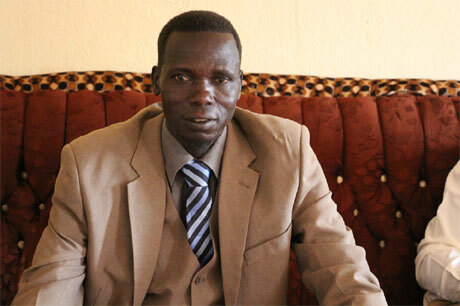 Former Governor Ruay to continue to have an influence on the government of South Sudan. Dr. John, Ezra and Joseph as they transition into the leadership of the South Sudan African Mission. Santino and Peter Gadet as their work in the capitol of Juba. ABC Students resume their studies after their summer break. In 1953, Paul graduated from Midwestern School of Evangelism in Ottumwa, IA. Because of his work with the people of South Sudan, in addition to other ministries, Paul was recently honored along with two others, with a Lifetime Achievement Award at their Midwest Heritage Homecoming IV. Greetings to you and Sudan African Mission board of directors in the name of our Jesus Christ Amen. May almighty God bless you abundantly. I’m in Juba and I have communicated with our local evangelists and our local congregation in Malakal is progressing well. They communicated that they are facing some challenges. Last year was a year of hunger and even this year also. There is a food shortage for everyone in the country; people survive with little food. They are facing diseases, some of the diseases which are caused by malnutrition. Since I came from Nairobi, Peter and I have been engaged with our church members, some were here in Juba and some came from Ayolo camp. After we nurture this congregation in Juba and it is established fully I will make plans to visit Malakal and our congregation there. A question frequently asked is “how do I know that the money we send for food or medicine actually get to the people most vulnerable in South Sudan instead of some government agency.” Because of international banking laws, documentation and receipts are required to show the money sent is being used as intended. In turn, SSAM requires receipts for all money before future money is wired. UPDATE ON YOURNEW AND RUAY’S TRIP TO THE U.S.
Yournew and Ruay were not able to obtain the necessary documentation to visit the U.S. The note received from Yournew said that perhaps this fall the trip would be possible. Please continue to pray that in God’s timing this visit may be made possible. For the past twenty‐eight years from 1988‐ 2017, people across the United States have been supporting SSAM by raising much of the money for relief aid assistance to respond to people’s needs. Things then do not compare to the current situation. Our young nation is at war with itself which results in higher market prices making everyone dependent on relief aid assistance and outside support. This year, thousands in our churches will be affected by hunger. Last year (2016) the rains were erratic, causing poor harvesting in all regions, this forced communities to leave their homes due to fear of war in South Sudan. These individuals remain in need of help to cultivate their own food this year. Some of our congregation members in greater Northern Bahr el Ghazal have gone to Khartoum in search of food and other living needs to purchase and distribute in mid‐June and July to the neediest in Malek. Much of what I say is about the hunger in our state as well as South Sudan in general. People are starving to death while others have gone to Northern Sudan to work for wages to survive. 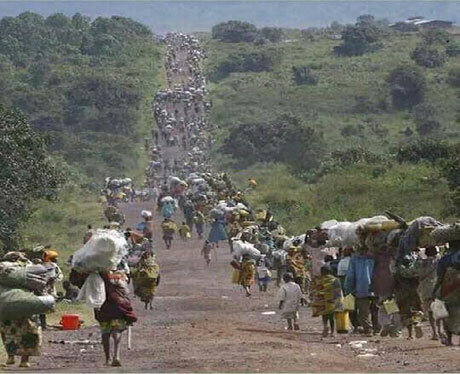 Some went seeking refuge by living with their relatives, leaving behind families and their loved ones in South Sudan. I have met five people who say about seven children were left at home while their parents went to Northern Sudan. UN Agencies have tried to help but still the situation is not under control. The local radio station announced that 64,000 people went to Northern Sudan which shows that there are great challenges for our government by not taking care of their people. People need to see their government pay attention and have concern for their conditions; however, the government is silent when there is more crisis. It has been two years since the starvation started in South Sudan because of the corruption in government officials. People don’t have capital to start individual businesses so they may be self‐reliant. This year is worse than the last year because this year money doesn’t bring food home; there is too much inflation to buy one sack of sorghum which is 10,000 SSP (about $100 U.S.) of which each gallon is 320 SSP and quite difficult for the vulnerable people to afford. We are planning to introduce cultivation plans for at least one plot for each person so this can help reduce the hunger level next year. We are praying for God to help us overcome every condition we are facing now in South Sudan. If you would like to contribute funds for the famine relief in South Sudan, please send your contributions to SSAM, PO Box 187, Gresham OR 97030. Every dollar designated will be sent to the people of South Sudan to help with their food crisis. I pray this report will reach and find you well. The work of the church ministry is going on well. After the three ceremonies (Malek Christian Hospital, Malek Church of Christ and the graduation ceremony of the Aweil Bible College) were conducted at Malek Church compound it encouraged many people in the area to turn and give their lives to Jesus Christ through baptism. 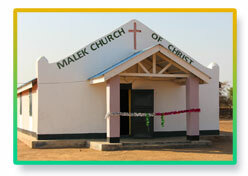 The opening of the church building has resulted in many new churches being established in all counties of Aweil State. 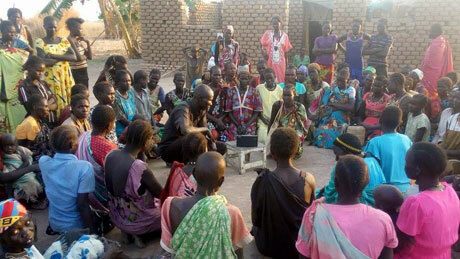 This year many of our new ABC (Aweil Bible College) graduates have taken the ministry work to their own villages. Our Lord is doing a great work in the lives of the South Sudanese. Famine crisis in South Sudan. Pray for stability of the economy in South Sudan. Peace and better leadership in government, other institutions and in the churches. Wisdom for the SSAM board members as they meet May 25 to discuss the ongoing needs of South Sudan. I hope you are all doing well in the States. I talked with Yournew, Ezra, Angelo and Dr. Garang at MCH (he said the medicine is out of stock because the diseased population was increasingly high the last months). They are all doing fine in the Lord. It's unfortunate that Yournew and Ruay’s trip has been postponed after such hope in them. Maybe God is planning the visit another day in the future. Of course, the first thing that caught my eye is the price of every commodity in Aweil town that is skyrocketing. Thanks lot for the prayers and support toward my return to Aweil. Dr. John with some of the children in Malek upon his return to the village. Receive my warm greetings with the hope that you are doing well as I am also doing fine here with my children. Along with my two evangelists, Paul and James we have mobilized our church members to clear the farm for the church farming. We have two small farms, one is for the groundnut (like the peanut in the U.S.) and other one is for sorghum. We have also planted seed and we are just waiting for the rain to fall. We have door to door evangelism every Friday. The women’s groups are doing very well. There is a Bible study every Saturday. Prayers are offered for their families and the sick people. On May 4th, I was in Malek to witness the closing day of ABC and gave the student words of encouragement.  Pray for the famine in South Sudan.  Pray for peace to come to South Sudan. YOURNEW AND RUAY MAY COME TO THE U.S.???? Ruay Deng, Governor of Aweil State, has been invited to come to the United States to attend a leadership conference this spring and it is a possibility that Yournew will be able to travel with him. At the time of the printing of this newsletter we have no details of their itinerary. Pray that everything will work out so Yournew can accompany Ruay and they will have time to visit with some of the Christians and supporting churches. We will post information on SSAM’s Facebook page (South Sudan African Mission) as we receive it. 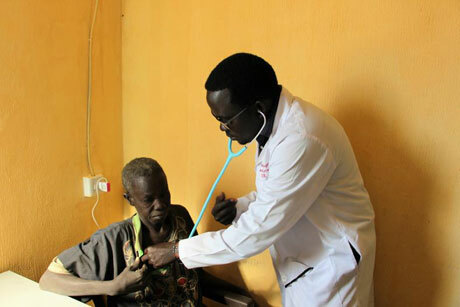 In our last newsletter, we featured a lengthy article highlighting Dr. John and two of his four dreams for the work in Malek and Aweil Town, South Sudan. Following are his third and fourth dreams. March 17th, SSAM received the following email from Dr. John. I am glad to inform you that I will be done with my studies in Malawi by the third week of April and I would like to go to Aweil immediately. I may be ready to fly out of Malawi between April 22 -24. I plan to leave Juba for Aweil the first part of May. My third goal is to continue the support of the Mobile Medical Clinic in the villages. The evangelists will take the Proclaimer devices with them with the aim of spreading spiritual and medical healing across the villages in and around Aweil area. Since I will have a shortage of manpower at Malek Christian Hospital and Mobile Medical Clinic, I will look into the cost of sending two or three of our qualified evangelists to Wau for Nursing and to Aweil Health Science Institute to train as medical assistants. The fourth thing I would like to work on is the Aweil SSAM coordination office. While in Aweil Town, I will ask about the cost of a wireless network installation and give SSAM a quote. The quote will also include a generator for power. I would like SSAM’s prayers for my trip back to Malek as well as the first few months of my return as I get settled since I have been away since December 2014. The following report from Luca was given to the SSAM team while we were in Malek in January 2017. Steve, Bev, and Brothers and Sisters in U.S.A. I am greeting you in the name of our Lord Jesus Christ our Savior. May God bless all of you. The church members managed to construct a church building with local material. We are now able to worship under the shade. We thank God. In October, we baptized five women and two men. Seven other people are attending our church and are ready to be baptized. The community came out on Christmas day and they were thankful for the church. The Sunday school children created a song of thanksgiving to God for the Christmas services. I like teaching young people as part of imparting the word of God to people. 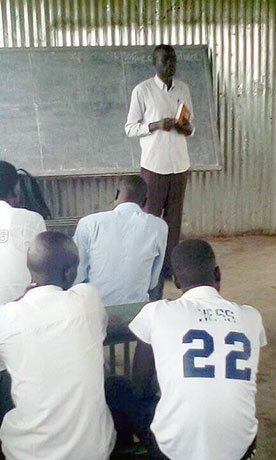 In the church, our evangelists that are working with me now are the A.B.C (Aweil Bible College) students. These evangelists are doing a wonderful job! An April 11th article on ABC news “Sliding into catastrophe’: South Sudan’s famine could spread stated that the famine is continuing to spread in South Sudan. “Hunger has become more widespread than expected. South Sudan’s Northern Bahr el Ghazal region (which includes Aweil & Malek) is on the brink of starvation, with 290,000 people at risk of dying without sustained food assistance.” Space does not allow us to print the entire article but if you would like to read all of the article, Google ABC news, Sliding into catastrophe, Sudan. Yournew’s visa application will be approved for travel to the U.S. The famine crisis currently affecting nearly all of South Sudan. Wisdom and courage for Hon. Governor Ronald Ruay as he leads Aweil state during this difficult time. Aweil Bible College students (ABC). Peace will find its way into the hearts of the leaders of South Sudan. While the SSAM team was visiting with Hon. Governor Ruay Deng of Aweil State, South Sudan in January, he shared with us that he remembered Paul Douglass (Founder of South Sudan African Mission) telling him many years ago that “one of these days the war between the North and South will be over and the North will abandon the tanks and other military equipment.” Paul told Ruay when this happened the military equipment could be torn apart and repurposed into farm equipment. Years later, Ruay remembered the conversation and was instrumental in building the Maper National Teacher Training Institute, a vocational school. The school teaches welding, masonry, carpentry, electrical and plumbing among other vocations. Congratulations to Aweil State on the opening of the Maper National Teacher Training Institute on March 9, 2017 with their first 100 students. The SSAM team visiting the vocational school while it was under construction in January. 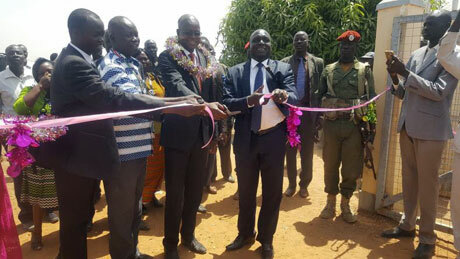 Governor Ruay cutting the ribbon to open the Maper National Teachers Training Institute in Aweil Town. Part of the Malek Church of Christ who came to greet the SSAM team when we arrived in their village. Northland Christian Church in Kansas City, MO supports Dr. John monthly and this is two of his four dreams, goals and plans. We will share the other two as space permits in future newsletters. Please know that I have not taken your support and prayers for granted. Your care through your daily prayers about the people of South Sudan make a difference. Because of this difference, I am who I am today. I receive so much support that I don’t deserve from friends like you. I realize this is because God has planned it as such. I am left not being able to describe my gratitude to everyone in words, but in my daily prayers I can never forget people like you. 1. I dream of building a maternity hospital in Aweil State, South Sudan. This dream gives me much hope but it seems unbecoming with the current man-made economic and security devastation in South Sudan. Assuming things don’t get reversed quickly, with my faith and hope in the Almighty God, I believe that we together can do something that will make the name of Christ be praised and glorified across South Sudan. It is estimated that 80% of the deliveries in South Sudan are not safe and are conducted by unqualified health care providers. This makes Aweil the worst place on earth where mothers still give birth under grass thatched houses (tukuls) and dust or mud plastered floors. At times a shelter is shared with goats, cows, chickens or dogs and communicable, zoonotic and infectious diseases are contracted during the process of childbirth. This contributes to poor maternal health and increases the chance of dying during, before or soon after childbirth. The child is exposed as well to communicable or infectious diseases because the birth attendants don’t have any basic knowledge and skills about cord care which allows an entry of microbes/illness into the blood stream. This explains the high neonatal mortality and morbidity rate in South Sudan. 2,054 out of 100,000 women died last year while giving birth or from pregnancy-related pathologies. This and other reasons give me such dreams and courage to continue seeking opportunities where I can support my people with the knowledge and skills that I have acquired. I dream that we could render compassion to the most remote villages in Aweil State. As an associate physician in Obstetrics & Gynecology, I would like, together with Yournew and his team, to support maternal and child healthcare services in Aweil and South Sudan. This aim is to provide services including prenatal doctor visits, a labor ward, admission ward for pre and post-delivery, a children’s ward and an immunization unit where newborns receive vaccines. This may be supported by the government and World Health Organization. I and the Aweil team will need a secure space and will start with affordable local materials and human resources. There is a nurse and midwife training college in Wau about a four-hour drive south from Aweil where we could train a few local evangelists. The course is completed in a two to three-year period. When necessary I and the team at Malek Christian Hospital and Mobile Medical Clinic will train the existing volunteers to conduct safe deliveries. As a peace building or peace supporting institution in the country, I believe we can change our country into a patriotic and peace loving nation through preaching the gospel and mentoring youth in leadership and community development. This is not a first for SSAM. All of us who have volunteered in SSAM, have planted and supported churches across South Sudan and have made a difference in many lives. I see love, faith, truth and great hope that we will have a better tomorrow. Those who have attended Aweil Bible College plant churches of Christ in Aweil as volunteers just as I am at the Malek Christian Hospital. They have demonstrated the love of God, followed the life of Christ and have risen to be national leaders. That legacy is seen in them, in us, in SSAM and in American people. I believe more will come to light if we put our trust in God. I believe that if I am back to Aweil and Malek, I can contribute a lot to what the team is doing there. I could support ABC, (Aweil Bible College), our evangelistic and church planting teams, the Mobile Medical Clinic, the Malek Christian Hospital and possibly a clinic in Aweil Town. Village volunteers can give time, money and talents to see this goal is met instead of relying entirely on our brothers and sisters in the USA. Pray for wisdom and courage for Hon. Governor Ronald Ruay as he leads Aweil State during this difficult time in the history of South Sudan. 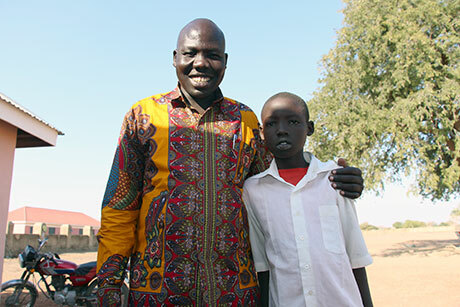 Ruay is one of SSAM's first graduates from Great Commission Bible College in Nairobi, Kenya. Kuac Wek Wol (John Kuac) serving in the Aweil State Parliment. John Kuac is also one of SSAM's first graduates from Zimbabwe Bible College. Peace and a spirit of unity would be cultivated in the hearts of leaders in South Sudan. It was a joy to walk in to the “kitchen” area (an open fire, a few utensils and a crude table and a couple of racks) of the Malek compound and see Regina sitting with a “Proclaimer” wrapped in pink bubble wrap to protect it from the dust. All around the area people were sitting in the dark listening to the gospel of Matthew in Dinka. In fact, the simple little solar, hand cranked or battery powered box was proclaiming the gospel loud enough to be heard in the entire area! Because of decades of war, most of these folks have never gone to school and can’t read either Dinka or English. In church services they hear at best a few verses at a time. With the Proclaimer they are able to listen to chapter after chapter. Regina will be teaching both the English and Dinka alphabet so that they can learn to read by following along in Dinka or English Bibles provided by mission supporters. What a thrill it was to see people hearing and embracing God’s word in their “heart language." I was reminded of this truth on my recent trip to South Sudan. After nearly three days of travel, we arrived in Wau. We were met by Dr. John, a couple of young soldiers, (security for our four hour drive through the bush) and the driver Kuach. After we cleared immigration and got our luggage, we had some moments to visit. Kuach said, “Thank you; your prayers have been answered.” On a previous trip I had prayed for Kuach and his four motherless children. “You prayed for God to give me a good wife. Since you were here I have a new wife and a three month old baby boy.” He continued, “Don’t stop praying, though- she isn’t perfect yet.” In spite of daily difficulty in his life situation and the heartbreaking loss of his wife, Kuach was always cheerful and he never blamed God; in fact he praised God anyway. Kuach reminded me once again that worship is not based on happenings (happiness) it is a conscious, deliberate choice we make. 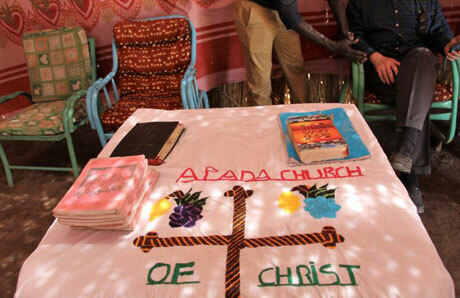 A couple days later we visited a group of refugees from Khartoum (part of the newly formed Apada Church of Christ). They arrived in Aweil with their malnourished children and whatever meager belongings they could carry on their heads. We met with them in a church building made of poles and native grasses…and they worshipped! We were able to arrange buy some food for them and have the local well repaired. Peace and a spirit of unity would be cultivated in the hearts of the leaders of South Sudan. Pray for wisdom and courage for Hon. Governor Ronald Ruay as he leads Aweil State during this difficult time in the history of their country. The Awil Bible College students and teachers as they begin a new school year. Bev's brother Stan, as he has recently been diagnosed with cancer of the esophagus and has begun radiation and chemo treatments. One of the highlights of the Aweil Bible College graduation ceremony a few days later was a children’s choir from this same group singing and dancing exuberantly and in spite of the dust and the heat- I worshipped. On Sunday we attended the first worship service in the new building of the Malek Church of Christ perhaps the most joyous ecstatic service I have ever been part of. Most of the people were wearing their one nice outfit and many in their only not so nice outfit, but all were garbed in “the garments of praise.” Worship often is not “because of” it is “in spite of” and ”in the midst of.”! Job said it all those years ago in the midst of his misery: “Even though He slays me, yet I will praise Him.” Worship is a choice: Let’s make that choice every day. Receive my best and warm greetings in the name of our Lord and Savior Jesus Christ. I wish you all a Happy New Year and Merry Christmas. To begin, I would like to take this opportunity to express my gratitude and appreciation for all the support to the people of South Sudan and to my own family in particular. If it had not been your support, I would not have gotten my advanced diploma at Great Commission Bible College in Nairobi, Kenya, the knowledge of God's word, plus my living allowance which I do receive every month.  The South Sudan African Mission and donors.